Many of the objects and technologies used today were designed and built by mechanical engineers. Mechanical engineering is a broad field that offers a variety of work and specializations related to designing and manufacturing mechanical products. Those who earn a bachelor's degree in mechanical engineering typically pursue careers that study and create materials, test machines and systems, streamline manufacturing processes and design mechanical products. Earning a bachelor's degree online brings convenience and flexibility to education while also allowing students to learn the skills needed to excel in the mechanical engineering field. Before starting an online bachelor's degree program, prospective students should learn about different schools, program requirements and potential mechanical engineering careers. Many online bachelor’s degree programs are available to those looking to study mechanical engineering. 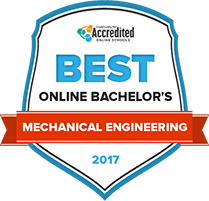 The following list ranks the best online mechanical engineering bachelor’s degrees based on factors like student-to-faculty ratio, subject areas, tuition and availability of job placement services for graduates. The online degree programs in this list offer mechanical engineering students academic and financial support to help them successfully complete their bachelor’s degrees and enter the workforce. Explore some of the 2017 top-rated programs in the rankings listed below. University of Massachusetts-Lowell’s program in engineering allows students to gain a BSE degree in mechanical engineering. The program focuses on a hands-on approach through its Build-Design-Test methodology, where students actually build and then test their designs, as the name suggests. Through this methodology, students are prepared to enter the workforce upon graduation or go on to graduate school. Graduates will be prepared to apply the fundamental principles of mechanical engineering in a work environment. Students start with courses in basic math and science, and work their way up to application courses relating to engineering. Students also take general education courses in the humanities. The University of Alabama’s mechanical engineering program prepares students to test, manufacture, design and analyze products that society uses. The program also focuses on the conservation of energy that drives machines. Students will be able to use a solid background in math and science to build practical machines. Students will conduct experiments, interpret data and design systems. Graduates go on to work in a wide variety of fields like construction, mining, automation, electronics, robotics, manufacturing and aerospace. Students can work in entry-level jobs in these fields upon graduation, and they start engineering courses in their first semester. Siena Heights University has an engineering program with a mechanical engineering option. The program is in collaboration with the University of North Dakota in that students take in-person fundamentals like math, science and general education at Siena Heights University, and then they take online engineering courses through the University of North Dakota. The material is complemented by face time with instructions at Siena Heights. The program culminates in two degrees, one from Siena Heights and another from the University of North Dakota, and takes about five years to complete. This allows students time to customize their education with complementary courses like information technology or business that can help them succeed as an engineer. University of Delaware’s mechanical engineering program helps students gain a wide array of skills and knowledge in one of the most diverse fields of engineering there is. Students will learn to design and analyze machines, materials and structures using the knowledge they gain in physics and materials science. Students learn a truly diverse level of areas to match the diverse field that is mechanical engineering, areas of study like dynamics, fluid mechanics, materials, solid mechanics, clean energy, nanotechnology and robotics. The program is highly customizable to make sure students are focusing on their areas of interest, like in the formal concentration in aerospace engineering. Northern Arizona University’s bachelor’s in mechanical engineering helps students become designers who are knowledgeable about the principles of motion, force and energy through mechanical solutions. Students learn about topics like fluid sciences, thermodynamics, solid mechanics and energy systems. The program has a solid base in mathematics and physics to help students go on to design the machines that power society. The school has an innovative Design4Practice Program, which helps students gain solid technical, professional and managerial skills. Students participate in hands-on projects like building an unmanned aerial vehicle to gain appropriate skills for entering the workforce. Kennesaw State University's bachelor’s degree in mechanical engineering technology trains students to apply principles of mechanics and materials to design machines and devices. The program focuses on a sustainable approach to using energy, as students learn to design machines like energy-efficient wind turbines. Students can either go on to graduate school or become licensed professional engineers. Graduates go on to work in fields like robotics, machine design, alternative energy, construction or automation. Students learn the necessary basic science and engineering principles to become successful professionals, as well as applied skills like computer-aided design. Indiana State University’s Bachelor of Science in Mechanical Engineering Technology teaches students skills to become engineers like mechanical design, management and analysis. Students will be prepared for both technical and managerial positions upon graduation. Computer-aided design is a huge emphasis of the program, and students learn how it is integrated with other engineering tools. The school has state-of-the-art CAD/CAE technologies that help students gain both hands-on and technical problem-solving experience. In relation to management, students will also learn to manage people, systems and resources to become effective at leadership on a project team. The University of North Dakota’s mechanical engineering department prepares students to succeed as professionals. Courses include hands-on laboratory experiences to help students gain necessary skills. Students study areas like space hardware design, nanotechnology, pressure vessel research, coal combustion and precision machining. The school states that mechanical engineering is one of the most broad engineering disciplines, leading to a variety of careers in areas like automotive, aircraft, power and defense. The school also states that nearly all students gain job offers before graduation or go on to graduate-level studies. Cooperative summer education and internship opportunities help prepare students for the workforce. Prospective students can also use the search tool below to find schools that offer online bachelor's degrees in mechanical engineering. The tool's basic search allows users to find schools by name, location, tuition and institution type, and the advanced search allows for more tailored results. Prospective students can find a well-suited online mechanical engineering degree program by looking at schools side-by-side to compare factors like acceptance rates, size, tuition and program offerings. An online bachelor's degree is a great way for prospective mechanical engineers to get their education in about four years. Whether designed for full-time students just beginning their studies or part-time transfer students, online programs can help individuals learn specific concepts and skills that can be used professionally or enhanced in continued education. See what a general timeline from admission to graduation looks like for an online bachelor's degree in mechanical engineering below. Admissions requirements vary among online mechanical engineering bachelor’s degree programs, but prospective students can get a general idea of the application process and requirements even before choosing a school. Students can streamline the admission process by being aware of common application steps and planning accordingly. Mechanical engineering students may have to meet math and science requirements before entering an online bachelor’s degree program. First-year students may need at least one year of calculus prior to admission, and transfer students may need up to two years of calculus and one year of lab sciences. Computer support is an important element for online students of mechanical engineering. Students enrolled in online mechanical engineering programs need to have access to a computer with a reliable internet connection. Students taking “live” classes may also need a webcam and microphone. Design programs may also be required. Students enrolling in online mechanical engineering bachelor’s degree programs often have to meet certain GPA and/or standardized test score requirements. Transfer students may not have to submit exam scores, but admissions coordinators will look at a GPA from their previous institution as well as their course load and its level of difficulty. Orientation and advising sessions are often available to students enrolled in online programs, giving them the opportunity to learn how to navigate online course delivery and to ask any questions they may have about the mechanical engineering program. Even if online orientation and advising is not required or available, mechanical engineering students should familiarize themselves with the course delivery system before the first day of class to answer questions and make sure there are not any issues with design software or other tech specs. In the first two years of study, students can expect to take a number of calculus and physics classes. A strong background in these topics is essential to learning many of the concepts and skills specific to mechanical engineering that students will see in their third and fourth years of their online bachelor’s program. Before exploring career-specific topics on a deeper level, students will gain a broad understanding of the ins and outs of mechanical engineering, including common methods and techniques used. They may be introduced to computer-assisted development, design and analysis as well as problem solving practices. Early in their studies, students will be exposed to materials commonly used in mechanical engineering. They will gain a basic understanding of the mechanical properties of materials like load, torsion, shear and bending moment, and carious properties of and circumstances affecting stress and strain. By the end of their second year, mechanical engineering students should have some knowledge of dynamics, or the motion of mechanical elements and the forces that act upon them. Additional subjects may be addressed, such as simple particle kinetics and kinematics, the laws of motion, work-energy and impulse-momentum principles for particle and rigid body motion. In the second half of their studies, mechanical engineering students will closely study motion, velocity, acceleration and force as they relate to machine design and elements. At this point, they may also be introduced to robotics and spatial mechanisms. Component design courses often mix theory and practice, so online students may need to attend on-campus labs to test stress and failure theory and to create machine elements like shafts, gears, bearings, clutches and joints. Junior and senior mechanical engineering students will be exposed to more advanced CAD and will learn how to design mechanical systems using advanced techniques, including computer-assisted drafting, solids modeling and computer-aided manufacturing. Before completing their degrees and moving on to professional mechanical engineering, students will learn about ethical issues and concerns related to the field. Topics may cover citizens and professionals alike, ethical dilemmas, risk and negligence, case studies and codes. Graduating from an online mechanical engineering bachelor’s degree program is usually a straightforward process. Internships and licensure exams usually are not required, so earning a degree is often a matter of simply completing coursework. Explore some of the requirements students should be aware of below. Before graduating, mechanical engineering students generally have to complete a senior design project. They may have to work alone or in groups to create a product or design that meets specific criteria. Online mechanical engineering programs often require students to participate in on-campus labs so they can get practical, hands-on experience and work with peers. Students typically must complete these labs to graduate, so those who cannot make it to campus should talk to an advisor before enrolling to see if alternative options are available. While some programs may give online students final projects to complete in lieu of exams, others may require students to take a proctored test at the end of a course. Students may go to their school’s campus, a different school with testing services or a local library with testing services to complete these exams. GPA requirements for graduation are generally stricter than for admission. Students who apply to a mechanical engineering program with a low GPA can often make up for it with test scores, extracurricular activities and other personal merits. However, those seeking a bachelor’s degree usually have to maintain a GPA of 2.0, or a “C” average. Because mechanical engineering is one of the broadest, most versatile types of engineering, those who earn their bachelor's degree in mechanical engineering will open themselves up to a range of careers. Mechanical engineering is growing slightly faster than the average of all engineering careers, but growth rates differ between specific industries and specializations within the field. Mechanical engineer bachelor's degree graduates should maintain current training in the latest design software and tools as it may increase their hiring potential. Below is a list of possible careers for graduates with a bachelor's in mechanical engineering. Mechanical engineers design and create a huge range of mechanical devices. Whether designing elevator lift systems, long-lasting car batteries or security sensors, mechanical engineers use computers to help design and test their products, so they must be proficient in computer-assisted design (CAD) and other position-specific computer programs. Mechanical engineers generally work full-time and spend most of their work hours in an office environment. An industrial engineer's primary focus is to streamline manufacturing processes and increase efficiency within a production facility. They may improve or design new systems that integrate machines, workers and product specifications so products can be made more efficiently, accurately and safely. Successful industrial engineers take into account available technologies, worker safety, time, cost, environmental concerns and various other factors when creating efficient manufacturing systems. Materials engineers study different substrates at the atomic level. By having a strong understanding of various materials, their properties and how they interact with other substances, materials engineers can determine which materials should be used to make certain products and can even develop new materials. Engineering managers may be responsible for overseeing internal operations from product design and development to staffing. Engineering managers often work with managers from other departments to make sure projects run smoothly. Students who earn an online bachelor's degree in mechanical engineering will be proficient at using computer design programs to help them with various aspects of mechanical engineering. CAD skills can be used not only for designing and modeling, but also for running analytics and testing products even before they are made. After earning an online bachelor's degree, mechanical engineering students should have a general understanding of thermal sciences, mechanical design and manufacturing processes as they relate to the mechanical engineering field. They should be prepared to take this knowledge and expand upon it in the workplace or in continued education, where program graduates will have the opportunity to explore topics in more detail and become area specialists. Even though they may have fewer face-to-face interactions with their peers than their on-campus counterparts, online mechanical engineering students will still gain management skills essential to working in teams and advancing in the mechanical engineering field. Through their bachelor's degree programs, students will learn how to manage people, resources and systems. Many resources allow mechanical engineering students to connect with peers, share ideas and get additional information about mechanical engineering and related fields while they earn their bachelor's degree online. Students can check out a few of them below. This sorority gives female engineering students an opportunity to connect with one another, build a national network of peers and engage in professional engineering organizations. ASME is a professional association for mechanical engineers. This organization offers benefits to student members, and many schools have their own chapter that give undergraduates extra opportunities to get involved in the mechanical engineering community. The MRS's University Chapters Program allows university students worldwide to connect with one another and exchange ideas. Many schools have chapters, and students who attend schools without chapters are encouraged to start their own. Pi Tau Sigma is an international honors society that recognizes exceptional junior and senior mechanical engineering students enrolled in programs accredited by the Accreditation Board for Engineering and Technology. Thingiverse allows users to store and share their own 3D designs and is a great tool for students learning CAD.